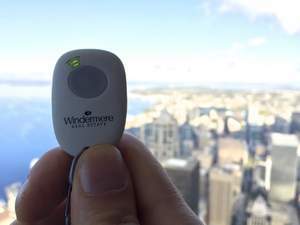 SEATTLE, WA--(Marketwired - Sep 22, 2015) - React Mobile, a leader in personal safety, today announced a program with Windermere Real Estate to provide agents in Seattle-area offices with a branded React Sidekick Bluetooth panic button to help enhance their safety when meeting new clients. The React Sidekick is a personal panic button that can be used to quickly and remotely activate a widespread emergency alert without the need to find, unlock and dial from a phone that may be out of reach. The React Sidekick pairs with the free React Mobile safety app to provide peace of mind and is the fastest way to reach a wide network when it matters most. "Windermere Real Estate is constantly looking for new innovative products to help ensure the safety and well-being of our agents," said OB Jacobi, president of Windermere Real Estate. "September is Realtor safety month which serves to highlight the challenges that real estate professionals experience in the field year round. We pride ourselves on making safety our number one concern and hope to expand the program to additional offices in the near future." Windermere hopes the new technology from React Mobile will give their agents an additional layer of security when meeting with new clients in unfamiliar locations. The Sidekick's modular, gender-neutral design makes it accessible to anyone and is perfect for agents out in the field. The Sidekick can be worn on a clip, carabineer or keychain so that it's always accessible in an emergency, even when a phone is out of reach. The React Mobile safety app is completely free to download and is a simple yet powerful way to enhance personal safety on the job. Users can easily activate React Mobile's "Follow-Me" location sharing service and rest assured that people in their emergency network are tracking they're whereabouts in real-time whenever they're concerned about safety. When the Sidekick is activated, friends and family will receive a "Help Me" alert text message and email that includes a link to the users GPS location. Users can also choose to automatically post their alerts to Facebook and Twitter to let an even wider network of contacts know where they are and that they need help. "Since launching the React Mobile safety app more than two years ago, we've recognized how our solution could benefit realtors during their frequent meetings alone with new clients," said Robb Monkman, CEO, React Mobile. "Our ultimate goal is to continue to provide an additional layer of security to give agents the confidence and peace of mind needed to perform their job." The React Mobile personal safety solution can also send alerts to emergency dispatchers in areas that support E-911. Recent news reports have revealed a nationwide problem with cell phones sending accurate location data when a call is made to 911. According to the reports, the Federal Communications Commission has issued new rules ordering carriers to improve the reliability of location data over the next several years.